The upcoming Acer Liquid S2 will have a Snapdragon 800 under its hood, as well as an impressive 5.98-inch 1080p IPS display, LTE and NFC connectivity. The 5.7-inch Acer Liquid S1 arrived in June and now it seems its follower is almost ready. 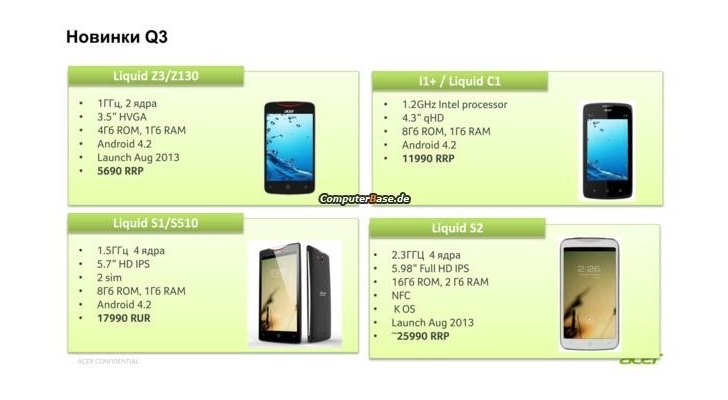 Codenamed Hemingway, the Acer Liquid S2 may arrive before the end of this month, as shown by a leaked company roadmap. The Acer Liquid Z3 also appears in the roadmap, its launch date being August 2013 as well. Unfortunately, these may only be the release dates for Russia, since the prices in the screenshot are in Russian Rubles. Even if the release dates for the US are going to be different, this leaked roadmap shows that official information should be available soon. We will talk again about the Acer Liquid S2 in just a few weeks, no doubt about it.